Actions speak louder than words. Or maybe the power comes within the words of the actions. In Ginger Lazarus’ Burning, a story of love, loss, and passion, follows Cy, a woman who is kicked out of the Army for being gay, fights a battle to right the wrong of treatment of women in the military all while falling for her friend Rose. With inspiration taken from Edmond Rostand’s Cyrano de Bergerac, Resonance Ensemble’s presentation of Burning is filled with passion. Between the themes of the military to the onstage romances, Burning explores critical themes that rarely find a place on stage. The trouble though is Burning is essentially two ideas that don’t quite blend perfectly together. And the more interesting story is Lazarus’ original story. But we’ll get to that later. Lazarus introduces a love triangle into her story, which naturally is a perfect set up to use the parallels of Rostand’s play. For those needing a refresher on Rostand’s romance, Cyrano, a poet with a distinguishable nose, falls for a young woman named Roxanne. Christian, a solider, too is in love with Roxanne but doesn’t quite have the words to express it. Cyrano, fearful of his appearance will cause his heart to be rejected, agrees to be the voice of Christian in order to woo Roxanne. 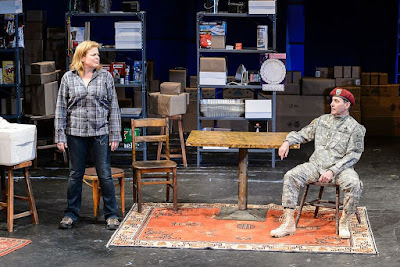 In Burning, Cy, a woman removed from the Army, takes on the Cyrano role, Rose, a waitress and frequent customer of Cy’s business, takes on Roxanne, while Cole, a solider, is the Christian equivalent. Bringing Cyrano to the modern age is stimulating. Rostand’s story about expressing the words of love is universal. But bringing it to a time of technology has its own set of woes. Cy, who’s relationship with Cole is weakly fleshed out, serves as a ghost writer for Cole to firstly win Rose’s heart and writing letters to Rose while he’s deployed. Additionally, gone is the nose. Rather than a physical obstacle preventing Cy from capturing Rose’s heart, it’s a metaphorical one. And it’s a stretch. Cy can’t be with Rose as she’s still traumatized from her previous experience and treatment in the military. It’s not a clean modern transfer, losing the charm of the original, but the way Lazarus crafts her script bounces between original and adapted ideas without truly marrying them. In the scope of the original story, the love story feels forced and pigeonholed. And it’s a shame because her original story is captivating in its own right. Lazarus shares a story about a series of cover-ups of female soldier “suicides” that may be a result of speaking the truths about experience and treatment. Using the device of a blog, she has Cy use the power of words to blast the truth to those willing to hear. And it causes strain on her life, her business, and those around her. This is the story that drives Burning to the top. The added element of falling for another woman is cute but not necessary. By far, the best example of Lazarus’ writing is the Act II scene where Cy and Dulac, the local general, go toe-to-toe. The scene is tense and powerful. And has little to do with the source material. With treatment of women being a prevalent topic in the script, there is one moment that is a bit bothersome. And it may be due to trying to harken back to Cyrano. When Rose, after her first night with Cole, comes into Cy’s shop, she appears with a black eye. Immediately you want to believe that Cole, like the other men in this world, struck her when in fact it was an accident of passion and inability to express his love through words. With the treatment of women so important, this tiny moment opens a can of worms. Ginger Lazarus crafted an incredibly complex character in Cy. She’s dynamic, fervent, and fearless. And it takes a true veteran to tackle her. Thankfully, Burning was led by the remarkable Catherine Curtin. Curtin drives the play forward, never faltering. She finds moments to expose her vulnerability subtly. And its heart wrenching. As the rose of her heart Rose, Shaun Bennet Fauntleroy is stuck in the middle of love. And at times, she’s stuck in uncertainty. Rose is like a ping-pong ball, being served back and forth between Cy and Cole. Fauntleroy’s Rose was ingénue-lite. Each character had passion in their story. Cole was passionate about his love for Rose. Only Sean Phillips didn’t quite play passion, rather he played anger. Phillips’ Cole lacked charm. And when compared to Curtain’s Cy, you’d have to wonder what Rose was thinking picking Cole over Cy. Though they may not have been a part of the love triangle, Sammy and Dulac were integral characters in the arc of Cy’s story. Zachary Clarence and Chris Ceraso made their presence vital. Clarence is endearing as Sammy. Clarence and Curtain have the strongest chemistry of any pair on stage. Ceraso makes Dulac a wondrous opposition for Cy. Seeing more of their battle would have been exciting, sadly love got in the way. Perhaps in the sequel. Venue selection may be more important for a production than many anticipate. Burning is a very intimate play. Yet the Theatre at St. Clement’s almost does a disservice to the piece. The stage is vast. The ceilings are high. With nearly no fabric to scenic designer Ashley Cusack’s set, echoes reverberated. And it hurt. Naturally, there were moments that the scenes wanted to be softer but the echoes that the space created made the beats suffer. And with such a giant stage to maneuver, director Eric Parness allowed his company to meander all over the space carelessly. Parness paid care to the intent presented by Lazarus but there seemed to be something missing. The barebones aesthetic that Parness and his team brought had its own set of pros and cons. With everything exposed, until it’s blatantly explained, it’s hard to know that the play takes place in Cy’s general store. The plethora of boxes and mismatched scenic elements didn’t help either. The lights by Pamela Kupper were basic, but when she incorporated the color in the back, it added a burst of excitement. The costumes designed by Sidney Shannon fit the characters pretty well, though you have to wonder if that’s what Sammy would wear if he’s truly open with himself. The only woe that Shannon and Parness brought that was a bit on point was the placement of the blood. Shot through the heart? Too perfect. It would be hard, at this point, to eliminate or reduce the Cyrano element of the script, but the more present it is, the less Burning succeeds. Burning fights through a lot in this production, but what it has going for it is an extraordinary character in Cy and performance by Catherine Curtin.